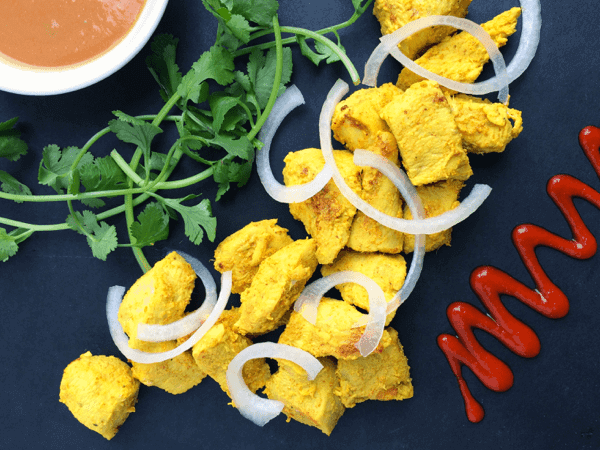 Turn boneless, skinless chicken breasts into tender, juicy, mouth-watering Thai Chicken Satay served with an addictive Sriracha Hoisin Peanut Sauce. I’ve made it no secret that one of the easiest ways to maintain healthy eating habits all year long is to cook with high-flavor ingredients that are naturally low in calorie. Thai flavors such as briny fish sauce, fragrant cilantro and bright lime juice enhance any dish without weighing it down. 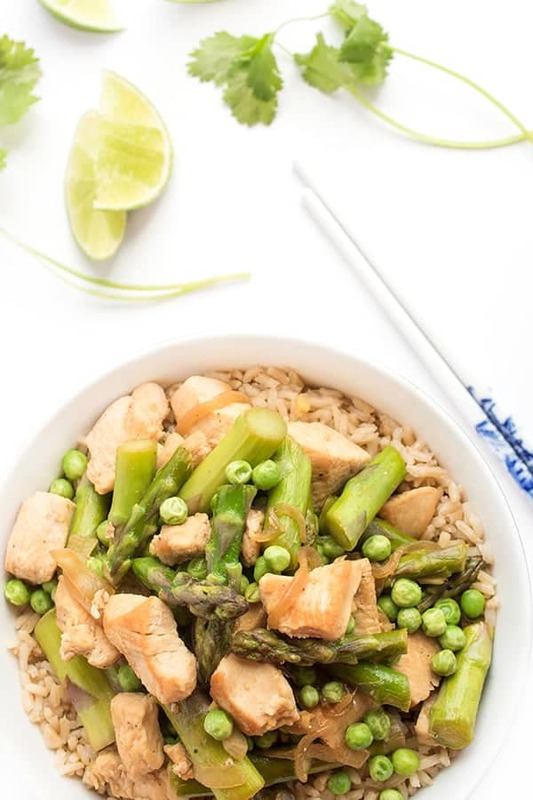 By keeping a well-stocked Asian pantry, you are never more than 30 minutes away from a delicious and nutritious meal that tastes nothing like health food. 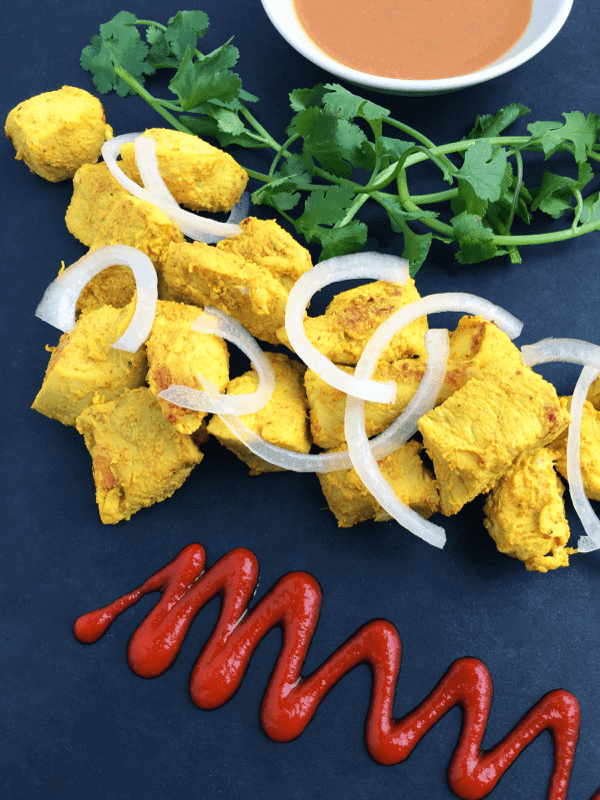 These Thai Chicken Satay bites came together in just minutes and my boys practically inhaled them. You can serve them over brown rice or roasted vegetables to keep it low carb. To balance out the spiciness of the sriracha, I created a quick and easy peanut sauce made with sweet hoisin – a Chinese condiment you can find online or in most grocery stores. This classic salty, sour, spicy and sweet flavor combination is exactly what makes Thai food so irresistible. By making it at home, you can control the quality of ingredients and save money. In a large bowl, whisk together yogurt, garlic, ginger, curry powder, lemon juice, fish sauce, salt and chili garlic paste. Add chicken breast cubes and toss until evenly coated. Marinade in the refrigerator for 30 minutes or up to overnight. 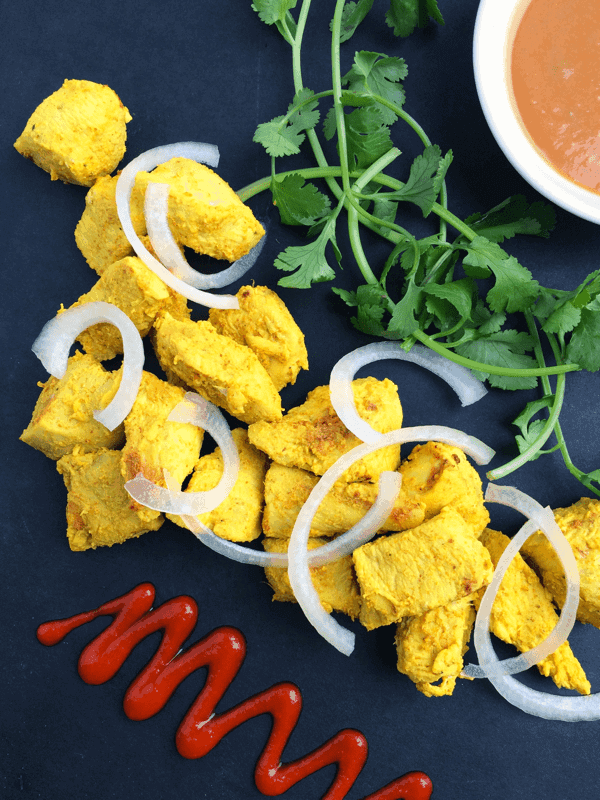 While the chicken is marinading, create the Sriracha Hoisin Peanut Sauce by whisking together peanut butter with lemon juice, warm water, soy sauce, hoisin and sriracha; set aside. To cook the chicken, heat a large skillet over medium-high heat and spray with cooking spray. Add the chicken to the pan along with all of the marinate and cook until chicken is lightly browned and cooked through, stirring frequently, about 7-9 minutes. 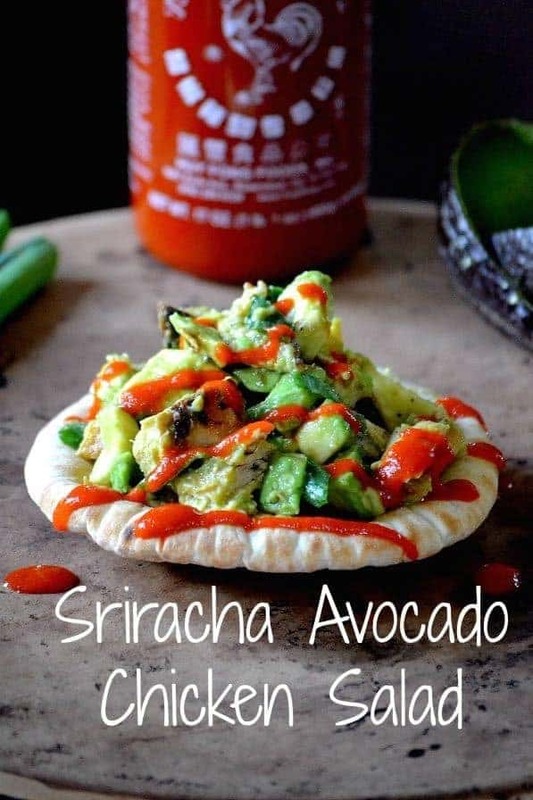 Serve with Sriracha Hoisin Peanut Sauce, onion slices and fresh cilantro. Liz, we absolutely loved this recipe! Including my daughter, who is a picky 15yo but gradually expanding her tastes to include some of the many ethnic foods the rest of us enjoy. 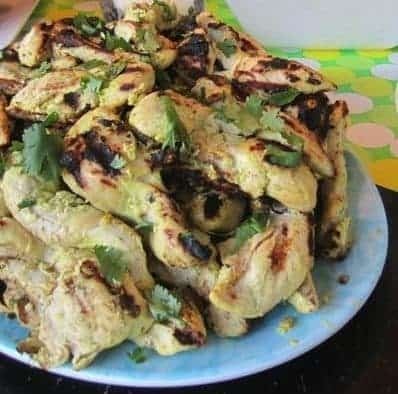 This chicken was so delicious and easy to prepare. I made the marinade before heading to work, so it was ready to cook when I got home. We served with lots of cilantro, rice, garlic naan, fresh pineapple, and broccoli. I will definitely make it again, either for dinner or for lunch sandwiches. I am so happy to hear this Linda!! Great job planning ahead as well. So glad you loved it! I made this tonight and I enjoyed it with all the complexity of flavors. My oldest child tried the chicken and it was too spicy for him. My husband liked it too, but felt there was too much acid/tartness and not enough sweet to balance that out. I may try this again with less lemon or sub with orange juice and see what happens. 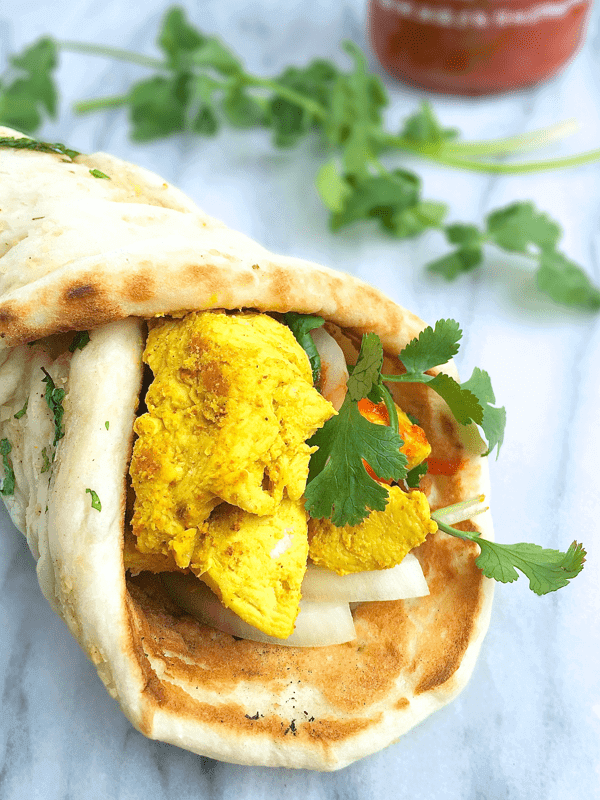 I love ethnic foods, so I appreciate your blog :) Thanks! I know all about accommodating the many tastes within a family!! I’m so glad you enjoy all my ethnic recipes! Let me know what else you try! Yum! Growing up I referred to hoisin sauce as Chinese barbecue sauce ;-) because of the sweet and savory aspects of it. Must make this chicken dish! I have been craving and cooking Asian food nonstop lately and it really is because the bold flavors satisfy me so much! This peanut sauce is something I NEED. Yes, please! That chicken looks dangerously flavorful. I love Thai ingredients, so this is right up my alley. I could eat Thai food daily! Hi Liz – sounds delicious. Love the color in your photos! I’m such a sucker for satay!! Home run!! This is so much my kinda meal! I just added more curry powder to our grocery list! So much color! I’d gladly eat this for all the meals. I wish I could make it for you! I hope you love it Ashton! HOLY. SMOKES. Does this look flipping GOOD! I want to make you a platter! I must try this! It looks so delicious! I love your philosophy of cooking with high flavor foods. I hate it when people equate healthy food with food that doesn’t taste good. That does not have to be the case AT ALL! I love the looks of this recipe. Peanut sauces make everything taste great! Thank you – yes, I’m all about the flavor! !